The new closing date for receipt of applications is now 28 April 2017. The Council of the University of Zimbabwe (UZ) invites applications to fill the position of Pro Vice Chancellor, Innovations and Business Development. The University of Zimbabwe is a comprehensive state supported institution located on a 220-hectare campus in Harare. It has a teaching faculty of approximately 1 200 and an enrolment of more than 17 000 students, offering over 100 first – degree programmes, more than 105 taught postgraduate programmes and several research degree programmes. Its nationally accredited programmes, which have international recognition, reflect the University’s commitment to scholarship and academic excellence. 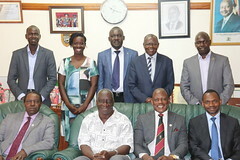 Reporting to the Vice Chancellor, the position is strategic to the attainment of the University’s mission and goals. The incumbent will be responsible for initiating, recommending, implementing and monitoring policies, systems and procedures dealing with University Innovations and Business Development and any other functions delegated by the Vice Chancellor. The position, therefore calls for a versatile individual who can provide critical leadership that will help empower the University to diversify its revenue base so as to strengthen its academic and research funding. This is a wealth creation and not a public relations position. The Council seeks an individual of personal and professional integrity with shows a distinguished record of innovations, business development and implementation of business projects as demonstrated by a business portfolio. An earned research doctorate (PhD/DPhil) and demonstrated analytical and business problem-solving skills are essential. The post requires an outstanding academic who has at least 10 years’ experience in University Innovations and Business Development: a respected individual with a proven record of business achievement, who is able to give business development leadership in an institution the size and shape of the University of Zimbabwe with diverse areas of requirements. Strategic thinking skills and progressive attitudes for effective articulation of the mission and goals of the University as these relate to business development. Proven track record of business projects developed and implemented. Demonstrable passion for business development and knowledge for project initiation. Demonstrable experience in commercialization of ideas with business potential including establishment of an incubation business Centre. Strong research and strategic business skills. Ability to determine the current and future competition of the planned and or developed University business. Capacity to develop criteria and systems for price regimes, product and service quality, product exposure, product improvement etc. Ability to negotiate with potential sponsors for business projects leading to joint ventures. Appreciation and understanding of the University academic business and how it impacts on University commercial business. Interpersonal skills to foster harmonious relationships between and among various University constituencies especially with the business sector. Emotional stability and ability to balance the requirements of different stakeholders of the University. Technical appreciation and understanding of the University finances, innovative administrative controls, budgeting, planning and investment analysis. Innovative abilities to initiate, develop and maintain creative strategies in business development to address the financial challenges that confront the University in the twenty-first century. Ability to create wealth and to assist in the development and implementation of the University business projects. Ability to establish public and private partnerships to foster business relationships. Information on the package for the position will be made available to short-listed candidates.